I hesitated to open this book, but I am so thankful I did. 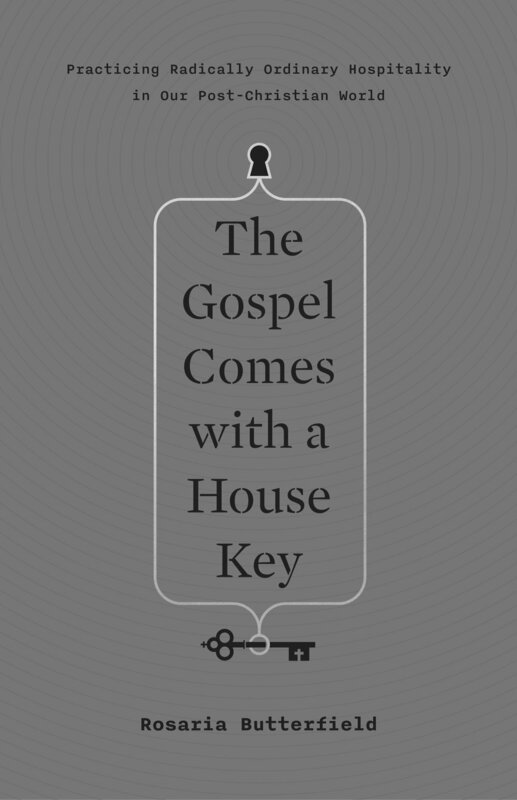 The Gospel Comes With a House Key reads like a memoir, sharing captivating stories with robust descriptions, real people, and raw events. And on those disarming and inspiring platters Rosario Butterflied dishes up honest words about biblical hospitality with the potential to transform the way you’ve envisioned it. Rosaria is clear that hospitality begins with a transformed heart. Our seat at the table of God won through the blood of Jesus moves us from asking the question “Why wasn’t I invited?” to asking the Lord “Who can I invite?” We first welcome not with the opening of our doors, but with the opening of our hearts because we ourselves have been welcomed and loved. I was convicted as I read that I mostly use my home to create a sense of personal security, relational safety, and good standing for myself rather than to invite people into God’s family. The person sitting at my table or playing in my playroom is often invited based on my desires. rather than the needs of others. The daily practice of bible reading, confession, and thanksgiving as well as participation in worship within the context of a local church reorient the heart of the believer to the fact that her home is the Lord’s and her table exists for his purposes, which Rosaria states is to put "the hand of the stranger into the hand of the Savior." Daily welcoming the stranger begins with neighbors and people in your path, cultivating eyes to see needs you might meet. While reading this book, I noticed that I started gathering the kids to leave a little earlier, or being more intentional about being outside at the times our neighbors walk their dogs or get home from work. It occurred to me that being rushed or hurried often kept us from conversing with neighbors. Small conversations over time build trust, but my husband and I are excited to begin inviting these neighbors into our home. I also noticed my eyes being opened to the needs of the people we interact with every week: grocery store staff, librarians, our paid nursery workers at church. We can be hospitable in conversation even outside of our homes. Ready to listen. Inviting people into relationships. The hospitality in Rosaria's personal conversion story and way of living are contagious. Throughout the book Butterfield shares the Sabbath practices and food prep routines of her family. She talks about making room in the budget, in her schedule, and at the table. I was convicted that my lack of organization and routine hinders my practice of hospitality. While a clean home is not a necessity for the practice of hospitality, an un-tidy home has often kept me from welcoming someone whose opinion of me was not yet established. Rhythms in housekeeping are also helpful to be ready for whoever God may bring to my door or prompt me to invite over then and there. One load of laundry a day. A clean sink every night. A picked-up playroom. Meal planning. Moment by moment faithfulness breaks down barriers for inviting people in. I was so thankful to hear her address boundaries in the final chapter of this book—to acknowledge that husbands and wives have different energy levels and that they need to be considerate of one another. I was happy to hear her confess her own introversion and limitations. Honestly, I wish there had been a chapter on considering the needs and limitations of your children but alas, she is in a much different season than I. And honestly, more than I wanted that chapter for practicality— I think I probably longed for it as an excuse. Rosaria leaves the discernment of boundaries to the reader and the Holy Spirit. I appreciated her descriptions of the way her children came to love the people they welcomed into their home and family life. It’s no coincidence that I was reading this book as we welcomed our newest son. People are excited to come over and meet the baby— they are bringing meals and stopping you on walks. And my 2.5 year old is always engaging strangers with questions. He's disarming. Hospitality doesn’t have to be practiced in a way that I must ignore my children, but can be especially beautiful when I involve them. It doesn’t mean that I have to let everyone hold my newborn or kiss him on the mouth, but it does mean that I communicate boundaries warmly while embracing the opportunity for interaction. We have committed to begin inviting people into our home weekly for a meal, and I pray that this “rhythm” will make hospitality a priority in the hearts of our children as well. I would highly recommend this book to the young mom with one word of caution: remember the gospel. As you read and see the impact of hospitality on Rosaria and the lives of her friends and neighbors, you may begin to feel guilty. I honestly found myself relieved to hear her confess an instance where she failed to practice hospitality well because the revolving door standard she seemed to set felt impossible. But Rosaria is motivated by a changed life and gospel humility- not hospitality superwoman pride. I would encourage you to beat back the lies of the enemy and to ask the Holy Spirit to convict and guide as you engage these words. Hospitality is a readiness to welcome who he brings in the strength and grace that he himself supplies. Don’t manipulate it to be about you proving something instead of him receiving glory and working in the heart of your family.